I was putsying around my store SS Home and noticed my 6'8" assistant Zacary waiting on a couple. All my customers loved Zac, particularly the women. Why I remember this part, I don't know but I had on a pale pink Juicy Couture sweatsuit, the one with the fold down waistline. Funny the things we remember. Anyway, Zacary and the couple were talking rather intently and it appeared extra help was needed so I went over and introduced myself. 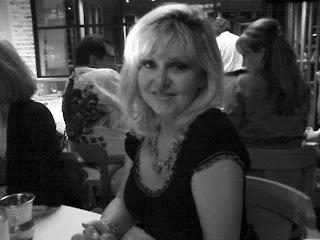 The woman, slim and attractive in her early sixties, said she had tried several times to reach me for design services...I hadn't gotten her messages. She said I was just about to give up on you. Her husband added, but we've found you now. This was the beginning of a very satisfying design project but more importantly it was the beginning of a lasting friendship. Charlene and John have been my best friends for over three years now. They literally got me through the toughest days after losing my darling Jim. Last November Charlene took me to her townhouse in Cape Cod. Just the two of us. We went to church jumble sales where I scored the most beautiful dried hydrangeas. Shipped them home! We went to a nearby historic tea house and had proper tea with scones, clotted cream, and berries. We dined out, often at the restaurant's bar near a fireplace. One particular dinner was on Charlene: lobster, not the tail mind you, but the whole creature at The Impudent Oyster. What a decadant treat. I'm told the locals don't usually do this. It's mostly for tourists. One day we took a quick plane trip over to Nantucket which was quaint and beautiful. We had a hard time finding a restaurant open but still had fun shopping and strolling the cobblestone steets. Note to self: no highheels on Nantucket Island. 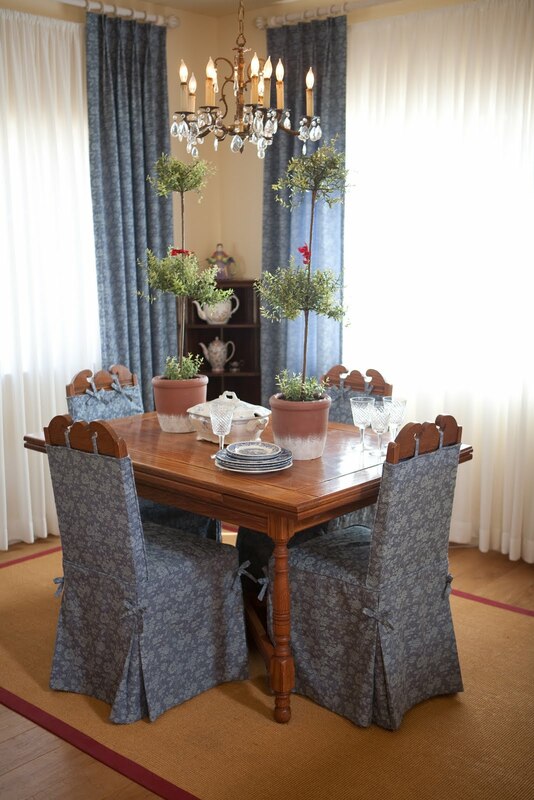 Charlene's House The challenge of Charlene's project was blending her existing furniture, antiques, and blue Spode and transferware collections in with the existing architecture and location. We did the house in her fav yellows and blues. The paint was already on when I got there and it was a well chosen shade. The hickory floors keep the place from looking too sweet. I love to have the contrast of a little roughness against pretty elements. It's that yin and yang, masculine and feminine thing I forever preach about. We chose simple tone on tone fabrics which means basically that the fabrics are patterned but your eye doesn't immediately see them because they have only one hue. In Charlene's case the hues are blue or yellow: a yellow on yellow faint stripe; a blue on blue faint floral. I didn't choose the ticking fabric that is on the loveseats. That was done before I came onboard. The upholstery shop where Charlene took the loveseats had limited fabric choices but no matter. They turned out just fine. I hate waste (and so do my clients!) so we worked with it. John doesn't care for the trunk coffee table but he tolerates it for Charlene's and my sake. They are so good to me! Can you imagine any other type of coffee table in this room? I know it's a little hard to set a drink down but my goodness it's gorgeous! 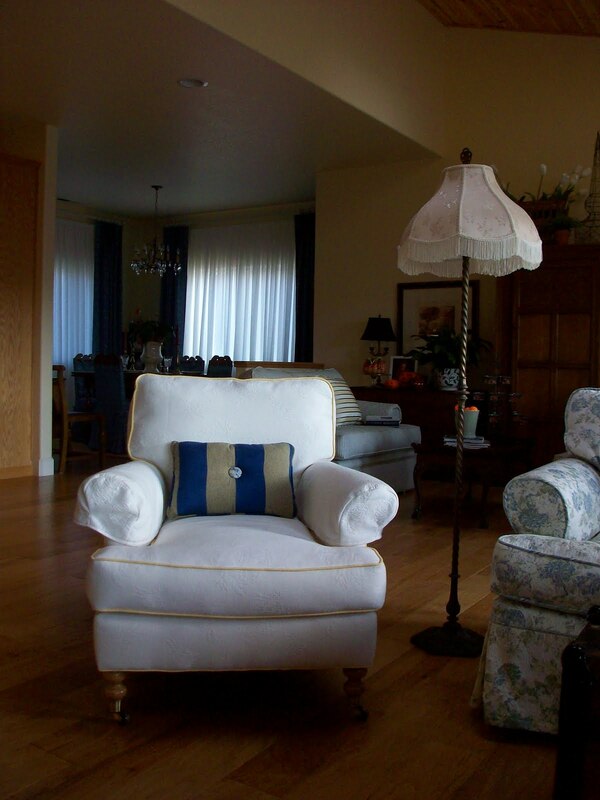 The white chair has pale yellow welts that match the curtains. Love the casters. Love the touches of red against the whites, blues, and yellows. Just a little touch here and there. Charlene was born in England and is a true anglophile. Her God Save the Queen pillow and Beefeater gin decanter are perfect reminders of her birthright. The tea set was a great buy at one of our local rummage sales and originally came from the family of another of my favorite clients! The primitive painting of the Episcopal Church of Sonora is by Ron Paris. 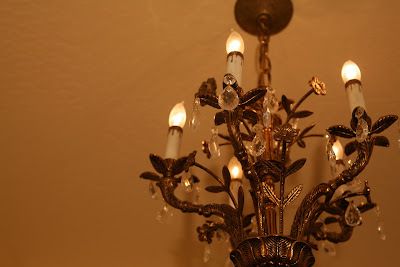 I love the light fixtures in the dining room, entry, and powder room. John chose them himself and they couldn't be more perfect. They really help tie together the architecture and furniture style and give the house a little whimsy. A touch of red you don't see in the pictures is the wood burning stove. I had to do a little coaxing but one of the best moves we made was removing the dark red Oriental rugs from the living room and dining room. We left the living room floor bare and just added to the dining room a sisal area rug with red trim. I actually like bare wood floors altogether but client's usually prefersomething under foot. This house is like perpetual sunshine. It has three large skylights and lots of western facing windows. In the daylight it's open and bright. In the evening it's warm and charming. It took some convincing but Charlene finally let me slipcover her little dining room chairs. What a difference! Charlene loves her house and I have immense satisfaction knowing I could do this for her. It's projects like John and Charlene's that make my job so rewarding. 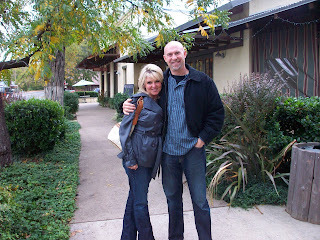 Los Gatos Apartment Makeover...plus the best soup recipe! My mom recently moved to Los Gatos. She has the cutest apartment right around the corner from downtown, and much to my delight, minutes away from a Border's book store. I purchased three new business books while waiting for her to get home from work. Mom is the perfect candidate for the half day Room Service home makeover from Shiree Segerstrom Design. She has enough furniture and accessories to make it interesting, and the need to have it pulled together in a fresh, appealing way. When my brother Robert and I helped Mom move in recently, I told her where the furniture should go so when I got there Wednesday, the furniture was mostly in place. It just needed a little adjusting. The sofas were too close together, the dining room buffet table was off center, and the dining room set had only two chairs. When SS Home was open, Mom was one of my best customers. They say 80 percent of your business comes from 20 percent of your clients. In my case it's 80% of my business comes from my mom. Teasing. Mom has two good quality taupe colored love seats, two good quality pale blue wing back chairs, a heavy contemporary brass and glass coffee table and matching end table, and an antique mahogany bookcase. She did not buy these from me but that's okay. To pull the taupe love seats and pale blue armchairs together I did four 18" down blend throw pillows in a navy Ralph Lauren floral. I usually do 20" pillows but they would have been a little big on these love seats. It's not so much the width of the love seat, as the depth. I do 20" pillows in chairs all the time. First thing to do in any kind of a makeover is assess the bones. Look first at what you have. I like to stand in the entrance to the space and first view it from there. 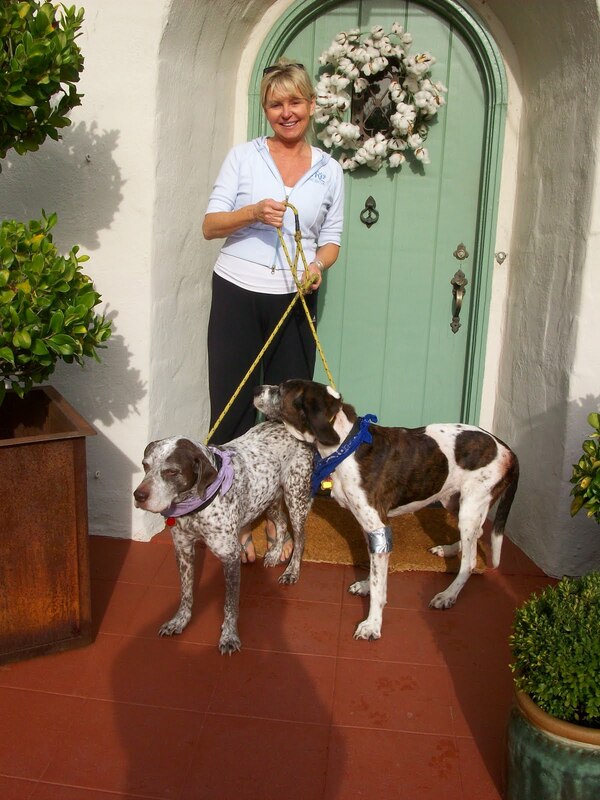 You want to keep traffic patterns clear, door to door, door to kitchen, door to bathroom, etc. Next, put the biggest pieces in place. Next, make conversation areas. Then add ambient lighting (overhead is already in place), then art and other accessories. For Mom, we made a solid, well anchored conversation area with her love seats, glass tables, and chairs. Because the apartment has a lot of beige walls, and because the furniture is small scale, the artwork was mostly hung low to anchor and keep the eye near the furniture. We did lots of coffee table books in stacks around the apartment. I think it makes a space more inviting to have books. 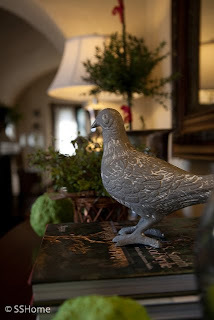 Other favorites of mine are candles, lap blankets, feather pillows (love the smell...ah luxury! ), pets, plants, flowers, and a stereo. No matter how beautiful your space, if you don't have signs of life it's just an empty shell. 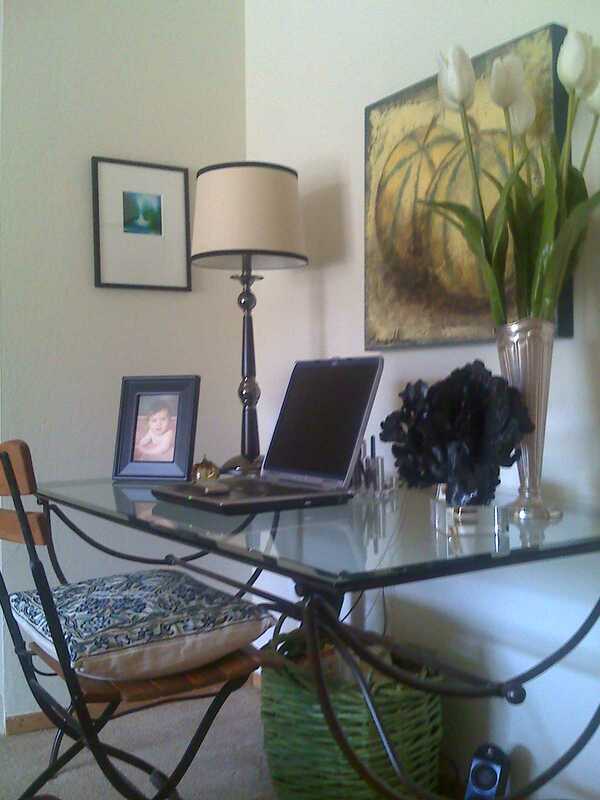 A few purchases from last year that really updated her already existing pieces were two black Moorish style mirrors; a contemporary glass and iron desk; a little wood bistro chair; and two black wood, transitional style chairs. 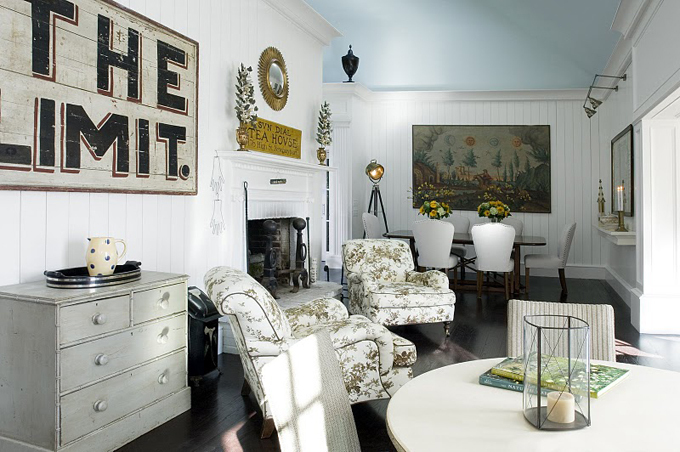 The variety of styles gives the spaces a kind of eclectic, casual yet pulled together style. It looks like the home of someone with a lot of different interests, which it is. The apartment looks like Mom, not her designer. Mom, by the way, has a name. It's Shirrel. The apothecary jar on the table is from Belgium...Shirrel didn't have her glasses on when she read this to me so don't hold me to those origins. 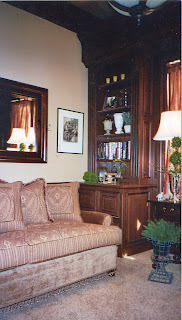 I just love the way the little bookcase works between the chairs. The chair pillows I think were from Pottery Barn and they are embroidered linen. The little glass and rattan dining table was Shirrel's mom's and it works nicely in small spaces because glass takes up less space visually than solid surfaces like wood. I think it was Mom's idea to put her gate leg table up against the wall, topped with a vertical mirror, and used as a sideboard. It really anchors that space without feeling crowded. Mom can comfortably entertain six for drinks or buffet dinner. The living room seating overlooks the balcony where she keeps her potted annuals. This year she had violas, yellow gerbera daisies, and lavender. 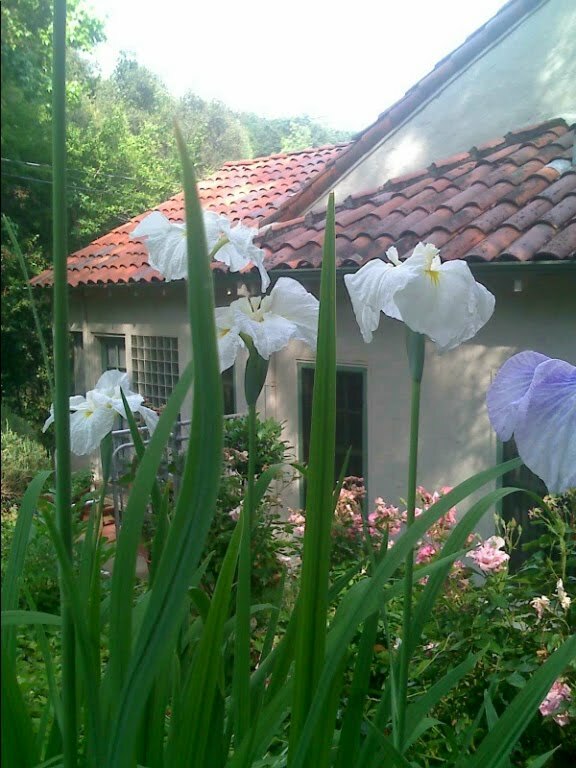 Los Gatos' climate is similar to Carmel and the flowers do well there. I didn't have time to do the kitchen and bedroom this trip. Maybe next time. Doing home makeovers is one of the best services I offer to people. I truly love doing this for my clients, friends, and family. It is immensely satisfying work with a 100 percent satisfaction rate. I have had nothing short of excellent responses to my Home Makeovers. RED BELL PEPPER SOUP...with all the rain in California, soups are still on the menu in my house. My guests and I favor this recipe I concocted. It's good for any rustic or casual occasion. I love it for everyday. 12 red bell peppers (only red! no subs); 10 oz. organic free range chicken broth (or to desired consistency); 4 Tbl. organic butter; 2 t. cumin; 1t. coriander; a teeny dash of red hot chili pepper flakes. Many thanks to those who participated in Design Dilemmas Q & A. I heard back from some of them and as I suspected, I didn't fully answer their questions in yesterday's blog entry. After a few emails, I think they were satisfied that their questions had been answered. Thank you for your patience while I improve my writing skills. I have been remodeling my old website and portfolio with the help of my photographer/brother Robert Watts and website guy Joshua Voelkert. After months of improvements the site is looking fantastic. Robert and Joshua have been trying to get the huge picture files onto the site. When those pictures are posted the site will finally be done. Click on this link and see. At the far right end of the toolbar on the new site are two of my favorite items. I enjoyed putting these very special services together with the help of LTD by Nada Jones . They are designed for people who want to "dip their toe" before committing to full service interior design. Nada also helped me with branding (making sure my message and pricing are clear with my potential customers); my collateral materials (brochures, mailers, etc); my media releases; and my written articles. She is incredibly savvy about my industry standards and reminded me it was time to get professional photography again ...how could I not see that myself? Hmm. 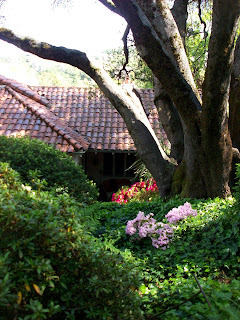 Tomorrow I venture over to beautiful San Francisco for a book signing for Michele Keith. 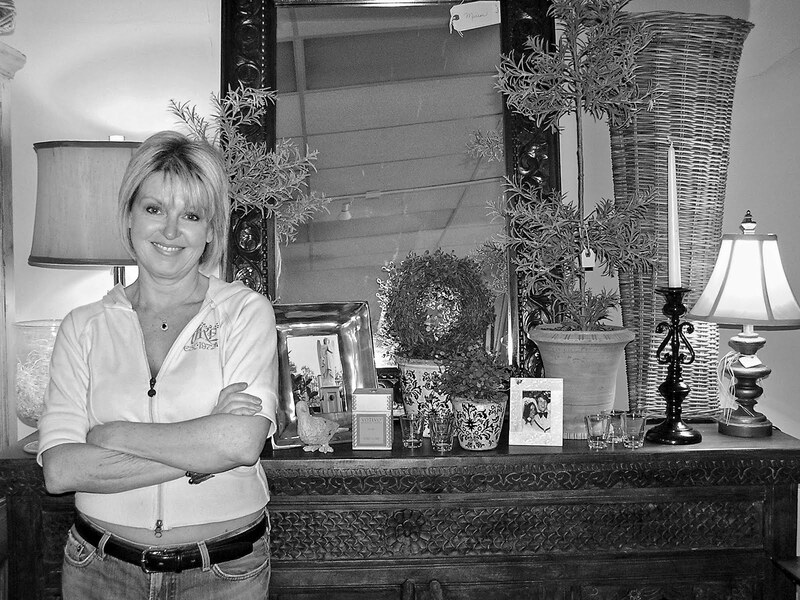 Her new book "Designers Here and There" is just out and she will be signing them at Sarlo Antiques at 295 Kansas. I met Michele on Face Book and she asked if I would like to attend. It coincided perfectly with taking Nana to SF to meet Ann who will be putting her on a plane to San Diego. After the book signing I will have coffee with said brother/photographer. 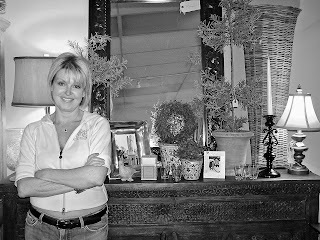 Then I visit a favorite client in Los Gatos to do one of my unbeatable Home Makeovers (it's my mom, lol). The price of my service? Dinner and a glass of wine. Please let there be sun. I really want to wear open toe heels. pale pink; and bright Kelly green. Here are my suggestions...remove your old blues and replace with turquoise. 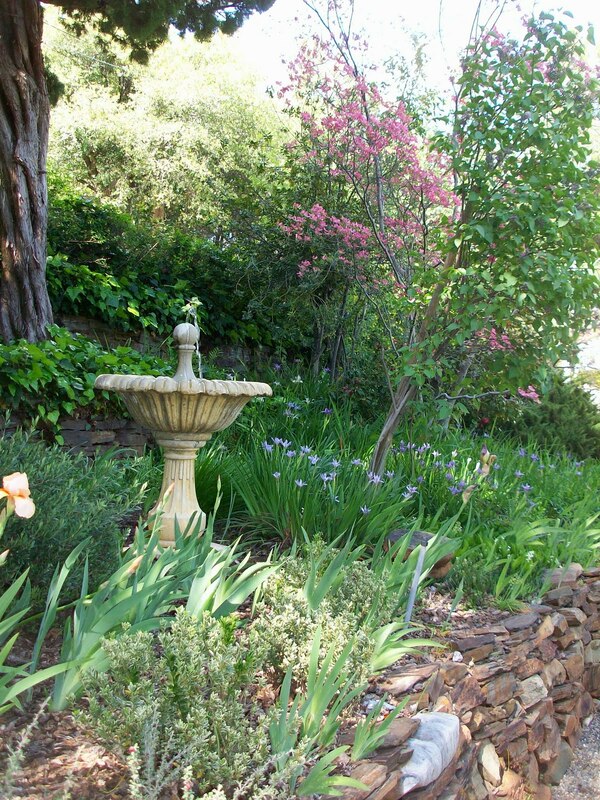 Remove your old clarets (shades of wine) and replace with magenta or fuscia. 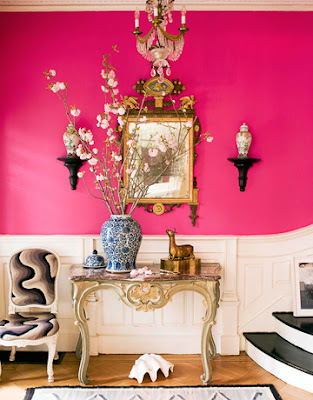 Remove your old taupe's and replace with pale pink. These new colors will instantly update your interiors and easily fit into your schemes. Shelly from Culver City, you seem to be saying you're tired of the pale blue you have in your kitchen. Turquoise would be perfect for the chair cushions on your breakfast set and it would still go well with your blue curtains. 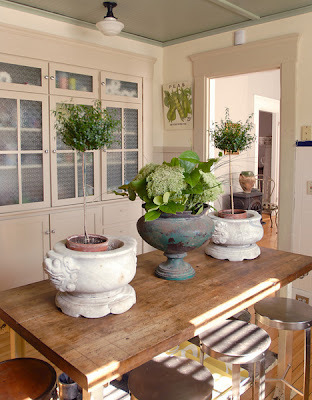 And you could have the butcher block painted a shiny turquoise to tie in your new shade. Andrew, (nice to have a male reader!) your place sounds fantastic. When can I come for a visit? Teasing. 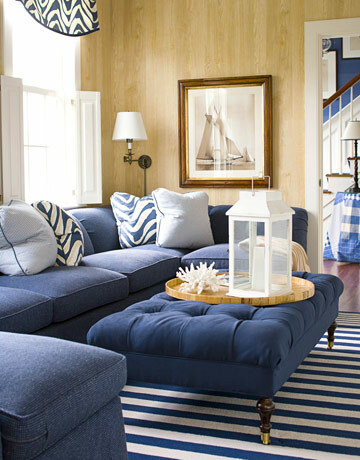 How you update your living room with color depends on how much effort you want to put into it. Replacing the celadon pillows with something newer like a bold, icy yellow would look great with the greens already in the room. When you add bold chunks of color in your fabrics, don't try and add busy prints. Use solid colors or simple graphic prints in two colors. 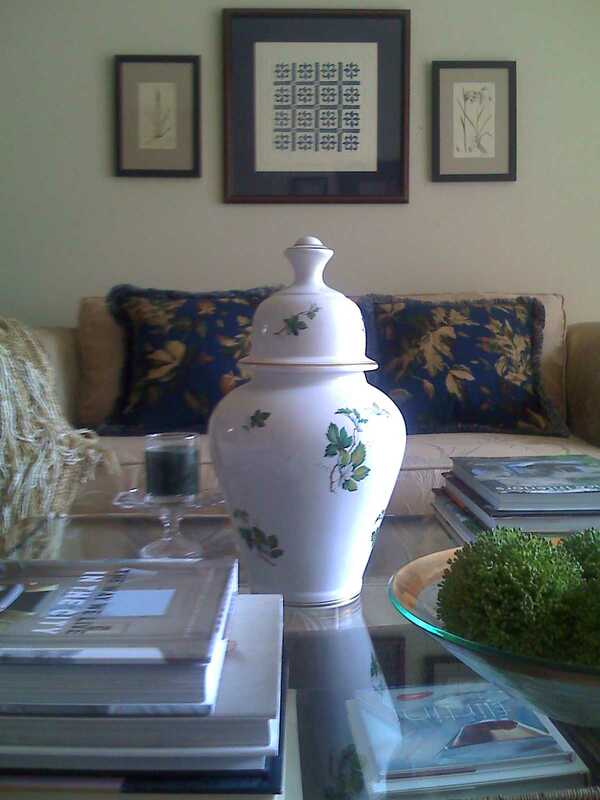 For quick, inexpensive updates change out throw pillows, pottery, and vases. 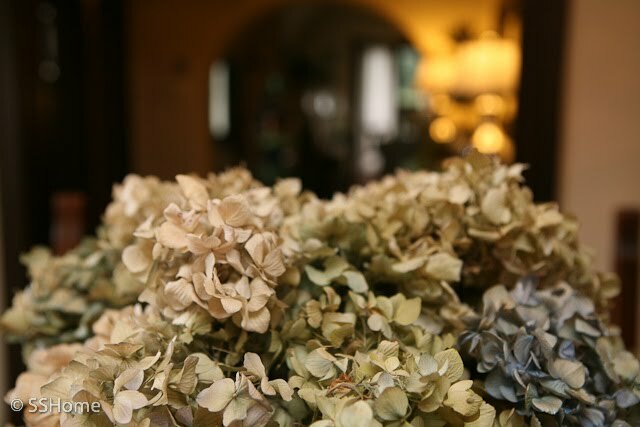 These are particularly pretty in bold colors when placed next to your other neutrals. I received a few questions about painting in open floor plans. Open floor plans are ever present in new construction. Personally I find open floor plans a little impersonal. I prefer the definition that rooms and doors create. However, the questions mostly pertain to "how do you decide where to stop and start wall color in open floor plans?" The answer isn't always easy. If your corners are bull nosed it is almost impossible to have your paint job look professional. Sharp corners, ceilings, and wall texture requires a steady hand. Keep color values (dark to light) to a minimum so the change of paint color won't be so obvious. Open floor plans ideally have one color throughout the main living spaces. In my experience, it's best to choose a light paint color or neutral for walls in open floor plans. Two colors besides beige that are workable in open floor plans are pale cool yellow and pale green. Warm green is more olive and cool green is more sage. They have distinct personalities. 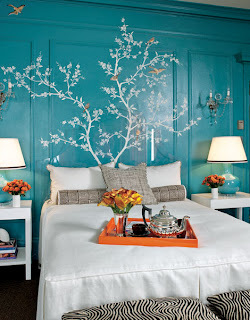 Pale blue is good in smaller spaces but can look cold in big ones. The same goes for gray. Pale peach, providing it's not too sweet can be pretty particularly if you have a lot of dark wood to give it a masculine/feminine balance. Zebra print pillows, by the way, would nicely update a peach and dark wood interior. I hope this helps. Color is a time consuming topic. Lastly, I had two questions regarding sofa purchases. Madelaine asked if she should slipcover her sofa or re-upholster. Either work well Madelaine. There isn't a significant difference in my slipcover prices but I don't know about other designers. 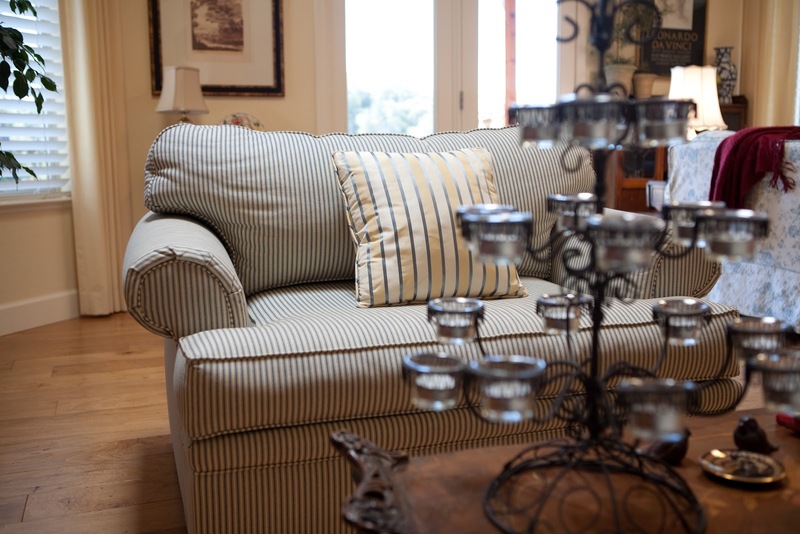 They both require the same amount of fabric, but slipcovers are made from cheaper fabric than upholstery. Upholstery labor is a little more expensive but isn't as easy to clean. Oh and make sure you don't wash your slipcovers. They need to be dry cleaned! I know you were told differently but trust me. I like to do a mix of upholstery and slipcovers in my projects. I love the personality slips have. They're imperfect and they have adorable little contrasting welts and ties. I'm a slip fan. I hope I have adequately answered your questions today! Finally a Saturday with sun. It was fantastic to get outside, go for a run/walk, and start the process of getting the yard ready for spring. The fountains needed cleaning, the topiary needed reshaping, the camellias, azaleas, and hydrangeas need feeding. David took a nap while I shuffled around the yard, pulling weeds one minute, watering a dry pot the next. I love putsying in the garden. Chuck does the big maintenance leaving me the small, fun jobs. Being a gardener has taught me things including tenacity. Every year I weed by hand and every year the weeds come back. This year's rain has brought back more than my fair share and I'm a bit overwhelmed. But it's like the saying "How do you eat an elephant? One bite at a time". I'll just keep trudging along and every day I will see a few more weeds eradicated. When I think back to my younger gardening days, the amount of Roundup I used was appalling. I hand weed now and use soapy water on aphids. So now the fountains are clean and burbling away, home to the neighborhood birds. 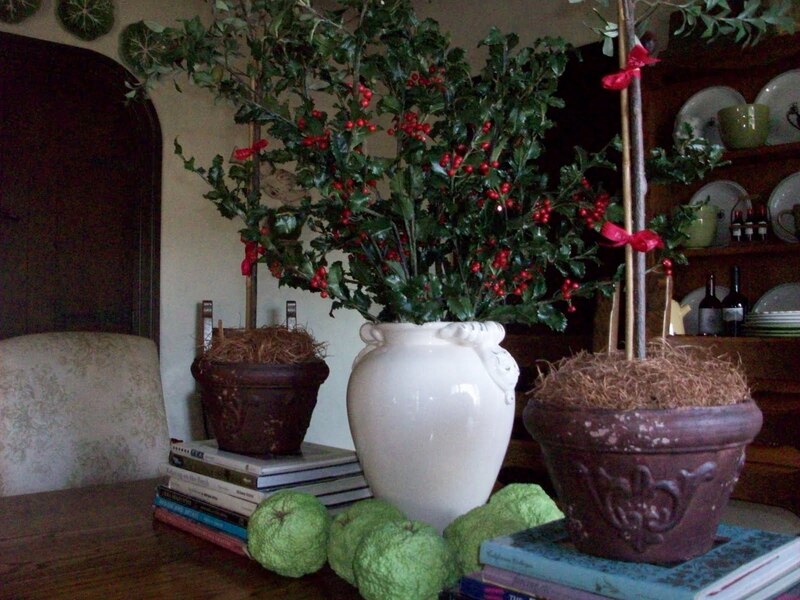 The boxwood, privet, and ivy topiary are pleasantly round again. There are still weeds to pull and always will be. They are here to teach me tenacity. Sacred Spaces, "Healing in the Garden"
statue lit from above. The furniture was quality I had never experienced. At one end of the living room were glass doors with a dining room set overlooking the backyard and pool. On the other end were chairs and a sofa where my cousins and I would perform songs and silly skits during family get togethers. I am a grown woman now with a decorated home of my own. As an interior designer, it is of course, my lab. I am aware of my surroundings more than ever and seek much solace from my nest. Three years ago my husband Jim passed away unexpectedly. It left our large family, our young adult son Christian, and me devastated. Jim and I were married 25 years and I had no idea how I would go on without him. I did go on. I went to counseling twice a week. I exercised and fed myself healthy meals. I went to dinner with dear friends. After a time I started having guests to dinner and started my design business back up again. One of the things that helped me during the first months after losing Jim was in my own backyard, literally. 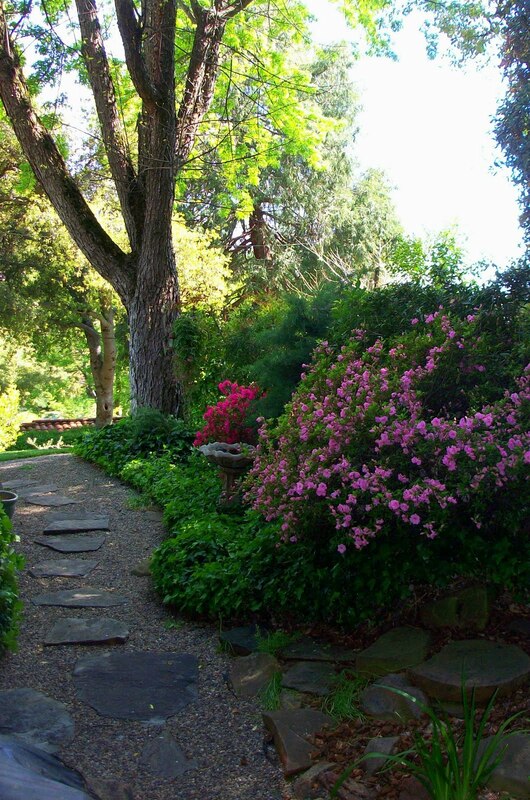 My garden, with its magnificent light and mature trees acted as a sheltering sacred place where I could reflect on memories. 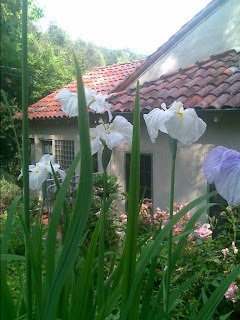 That first spring and summer I spent every day in the garden, or more specifically, different spaces in the garden. 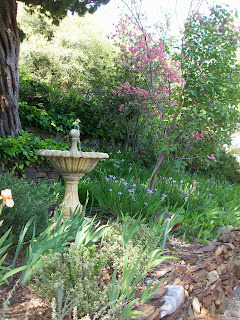 One spot in particular was a little seating area I set up just below the rose beds. The sun sets behind the roses and the wicker bistro chairs, table, and iron daybed with big feather pillows in ticking, faux fur, and paisley fabrics acted as my room. This spot at three or four in the afternoon is magical. The shadows are long, the light dappled. With my iced tea and the chirping birds and the sound of the fountain, I'd sit and go through my memories intent on remembering everything. His voice, his features, his personality. The garden is terraced with old stone walls framed by an ancient oak tree, an old crepe myrtle, a 100 foot liquid amber maple, and a gorgeous flowering Japanese cherry. 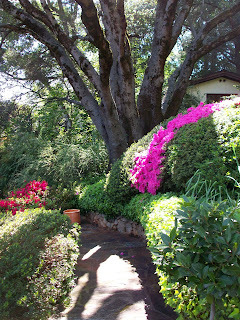 There are huge azaleas growing in clipped mounds in over 23 colors and varieties. 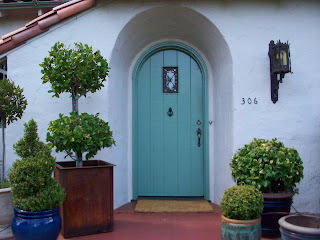 There are numerous lilac trees, a dogwood, and five standard bay trees in an allee' of big celadon pots. All the beds are rimmed in various types of boxwood. There are wintergreen boxwood's and little euonymus boxwood's, both solid and variegated. 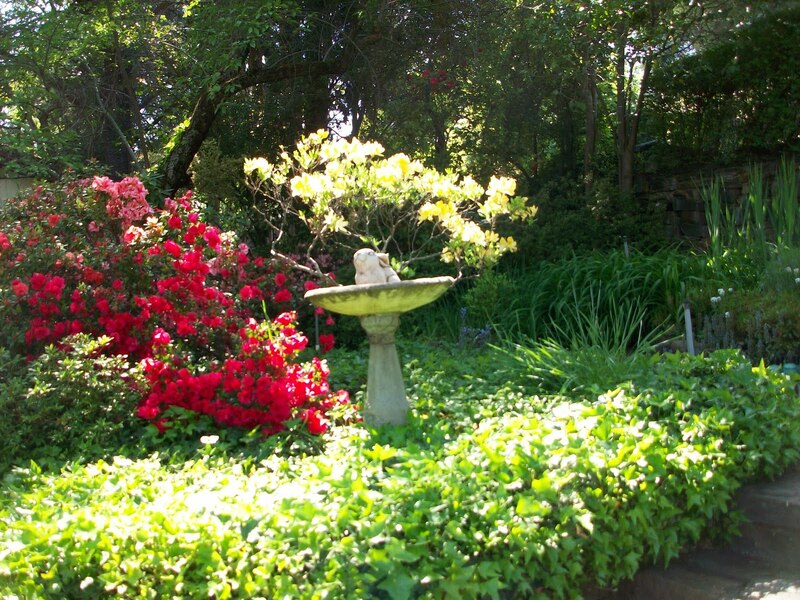 I have a few statues, chosen to be unimposing, and a beautiful aging fountain that I had installed in honor of Jim. Jim loved birds and the sound of water is so healing so it seemed a wonderful tribute. Another space that I found to be healing is the outdoor portico which is located off the living room. It has plenty of seating, a wicker settee and chair with feather cushions and plump pillows, a few Adirondacks, a picnic set topped with a collection of healthy ivy topiary. But the chair I prefer has a view of the great old stone stairs that lead up into the main garden. 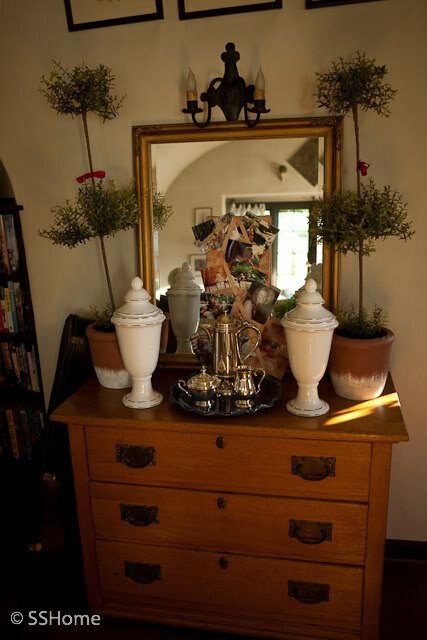 I can sit there for hours with a book sometimes reading, sometimes napping, the afternoon light hitting the tips of new, moss green growth on the large, round boxwood globes. Sometimes I light candles or garden incense. I also like to do my Yoga positions here. This is a treat not a chore. I have a couple places in my home I consider to be healing but the outdoor ones are my favorites. Being close to the sounds, smells, and beauty of nature allows me to feel closer to my true self. It's a feeling of being grounded, on the road to healing. Coming up...Q & A series "DESIGN DILEMMA'S"
Send in your design questions by cut-off date Sunday, April 18 midnight. Questions will be used (and answered) in my design series April 19-23. 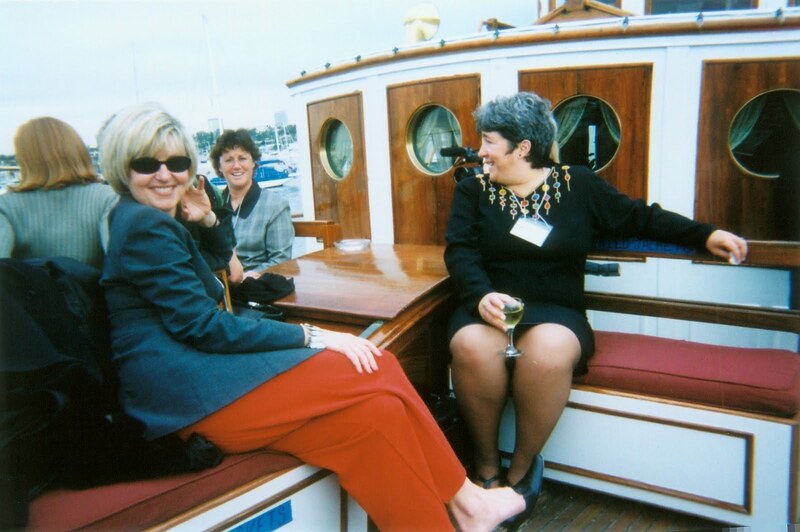 At left: Kate Segerstrom, Bonnie McGrath, and Shiree Segerstrom aboard a vintage yacht. Family reunion, Newport Beach. For the past several months I have been busy working on my branding, marketing, and pr plans with LTD by Nada Jones. Nada is a marketing guru and co-author of Sixteen Weeks to Your Dream Business. LTD, by the way, means Live the Dream. She pointed out that my website needed updating so we've been working like mad with my brother SF photographer Robert Watts and web guy Joshua Voelkert to make it happen. In doing so I discovered my design philosophy (how I approach each project aesthetically) needs tweaking. Design project right (from 2003 I think) I would remove the topiary from the coffee table, I would make the room less pretty, and add some contemporary accessories. SS Home. 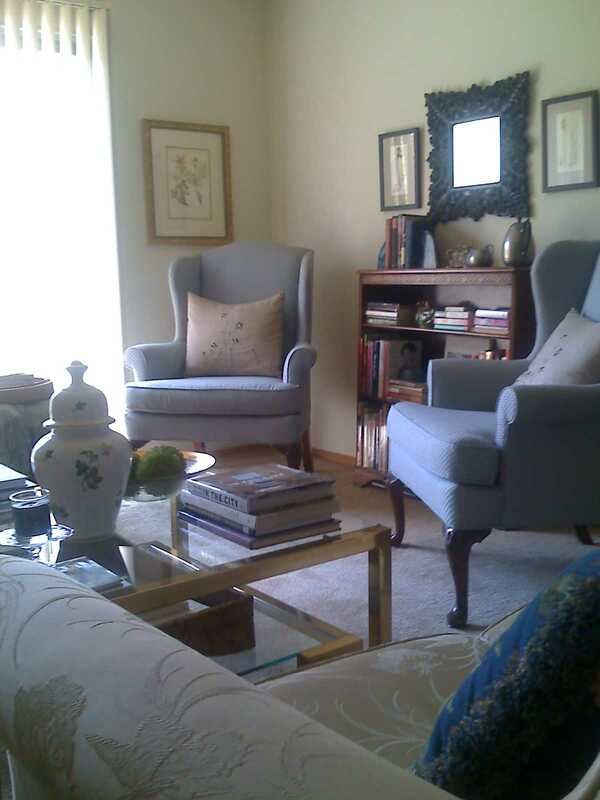 One of the chairs was an heirloom from my client's mom that we covered in a golden yellow bee print silk. I think they are called balloon chairs. All the iron hardware is custom. It's expensive but it's a lifetime investment. My house still has the same iron hardware from 1931. The last two updates would be the window seat pillows (not shown). 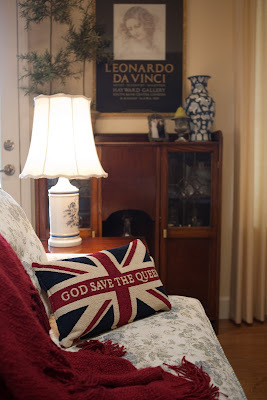 I would do quirky, less pretty pillows maybe in some antique fabrics or quilted pillows. And a more interesting cocktail table, either an antique tea table or a low slung ceremony table like you see in Oriental style homes with the wide legs and lacquered finishes. For my own house update I'm dreaming of a new cocktail table too. 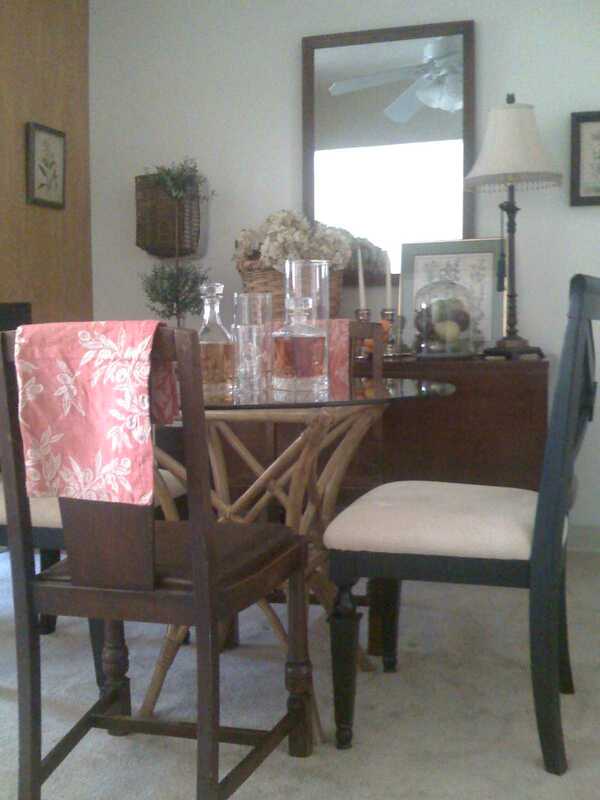 I'm thinking of black wicker with a lower shelf. I know my living room needs a solid, heavy table to anchor the main seating area but black wicker would look really fresh. I don't normally use glass coffee tables in my projects but never say never. Glass cocktail tables are one of my pet peeves. I like them to be smart and interesting, not cookie cutter. Some of the decorating styles that are really hot right now are bohemian, Moroccan, modern/retro, and Hollywood glam/regency. I'm still seeing a lot of modern lamps and loving them. 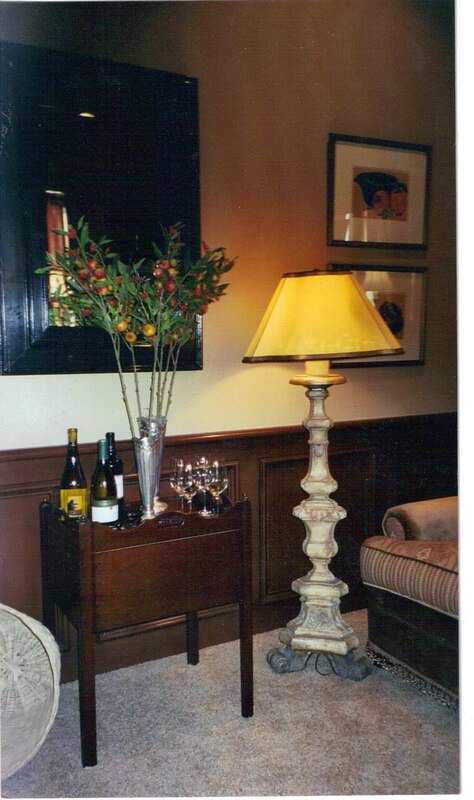 Check out Jamie Young for the hottest styles in lamps. Mercury glass is still really fresh looking too. They're easy to integrate into most home styles and instantly freshen up your look. Animal rugs and prints are also great and easy to integrate. Suzani quilts are fun. Moroccan accessories are really hot and go well with several styles as long as they can take center stage. Modern works well with Moroccan, and some types of traditional. Check out Martyn Lawrence Bullard Moroccan style. He has the style down pat. To update this chair above I would paint the frame a fun color (a scary thought for many clients and requires a little arm twisting!) and maybe a contrasting solid color or print. It was a gorgeous day outside which made today's projects so much easier. Robert Watts, a SF photographer and my baby brother, came with his lights and outstanding camera to shoot two more SSID designed homes for my new website. I played photo stylist to Robert's photographer. The fun part of my work is the creative part where I actually get to 'decorate'. 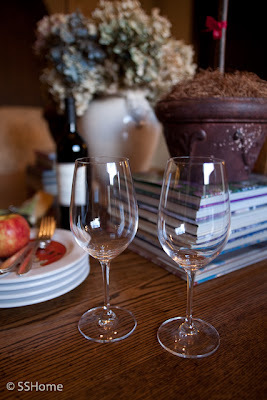 I 'borrowed' books, vases, candles, statuary, wine bottles, tablecloths, pictures, and a few novelties (specifically a French wine barrel slat that's been made into a candle holder) from my own home for the first shoot. I styled the living room coffee table, end table, mantel, the dining room table, the kitchen counter, and one guest bedroom. Robert being Robert shot endlessly. He is a perfectionist and his work shows it. He has an unerring eye, something instinctive. I did the coffee table loaded with hard bound design books, big clear seeded hurricanes, little candles, and a crumbling fruit basket statuary. Very fun and a little busy. 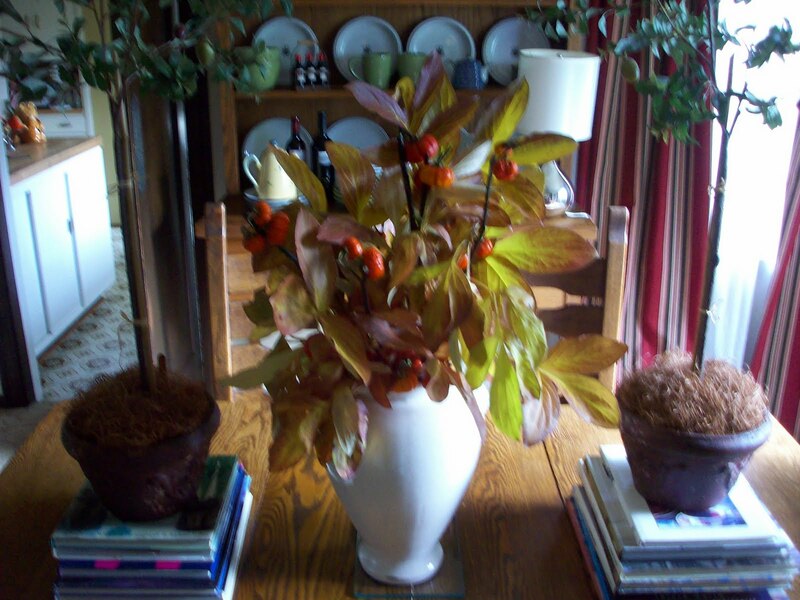 The dining table I did with a faded red olive motif tablecloth slung to the side, an oversize mercury vase with fresh greens, and two 30" (that's pretty tall) myrtle topiary in clay pots. The mantle was very simple with little bottle green bulb vases holding hyacinth, Osage oranges (not really orange but bright lime green) also known as horse apples...love those interesting bumpy little fruits, L and R's gorgeous oil landscape by Leslie Hurst, and my own funky painting, Chinese House Man Holding a Birdcage. The first house to be shot was a very rustic, Spanish style home built around 1995. I counted nine sky lights in the main house alone. The floors are tile, the walls are stucco. It has gorgeous hand carved beams throughout. 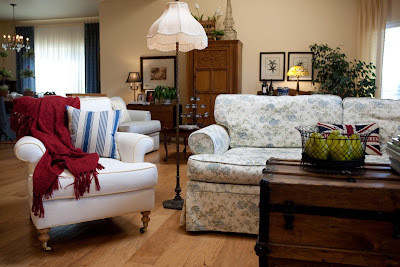 In this home I did a slip covered sofa and armchair, two small upholstered secondary chairs in an ethnic stripe, a rustic coffee table, matching television cabinet, a planked wood dining room table, 6 wood and straw chairs, and 2 slip covered parson chairs in a brown print with pale blue trim and ties. 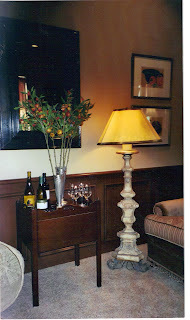 And a beautiful bronze Jamie Young lamp with a silk bird motif shade. I like the shade because the bird motif matches the hand painted designs above many of the doorways. I did custom pillows and curtains too. The second shoot was a much different style home: different architecture, different clients. This particular client had a lot of accessories to work with, many of them purchased from my store. She calls her style Cape Cod. I call it 'vedy' British. I restyled the living room simply by rearranging the pillows and doing a new arrangement on the coffee table. I had already accessorized this place a few years ago so today it just needed a little freshening up. I did a wire basket with lime green pears and a stack of coffee table books. In the dining room...so sweet...I again did two 30" myrtle topiary and a cream and pale blue British soup urn. Then we set the table for an impromptu snack with wine glasses and a stack of dessert plates. When I was done, even my brother the minimalist thought it looked great. He was so inspired, he took 300 more photos! Just kidding. But I bet he took 150. This client loves yellow and blue, the colors of Sweden not Britain, but no matter! She loves it and so does her hubby. And so do I. We did a new floral slipcover for her old sofa, custom pillows, a new cream color armchair with contrasting trim, custom window coverings, and slip covered dining room chairs to match her curtains. With her living room, dining room, master and guest room done we're now at work on the study/television room and outdoor patio. Here are the five easiest steps to furnishing your first home, almost from scratch. This can be a daunting task. Build a budget, a three to five year purchasing plan, make seating first priority, then dining room tables and chairs, and then accent chairs and occasional tables. Once the big decisions are out of the way, it becomes a little less daunting, and a little more fun. Step One: Assess and re-purpose what you have. 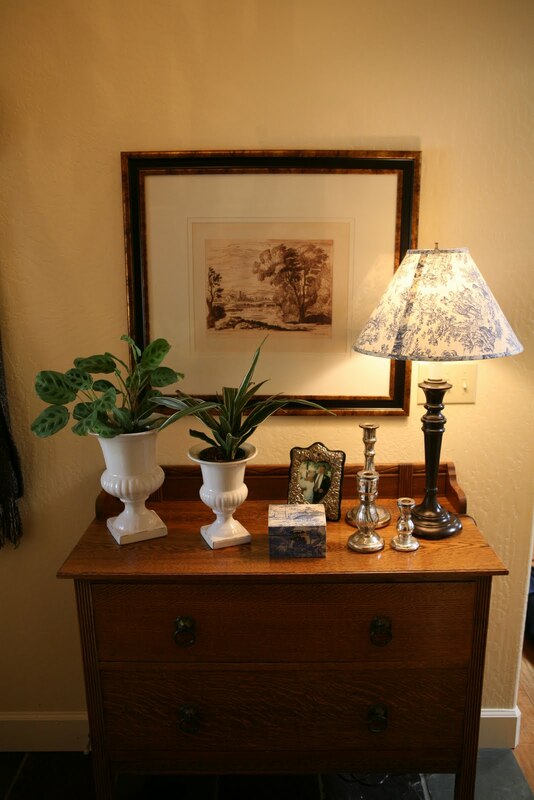 You may have inherited pieces such as a grandmother's dresser or have some items left over from college. 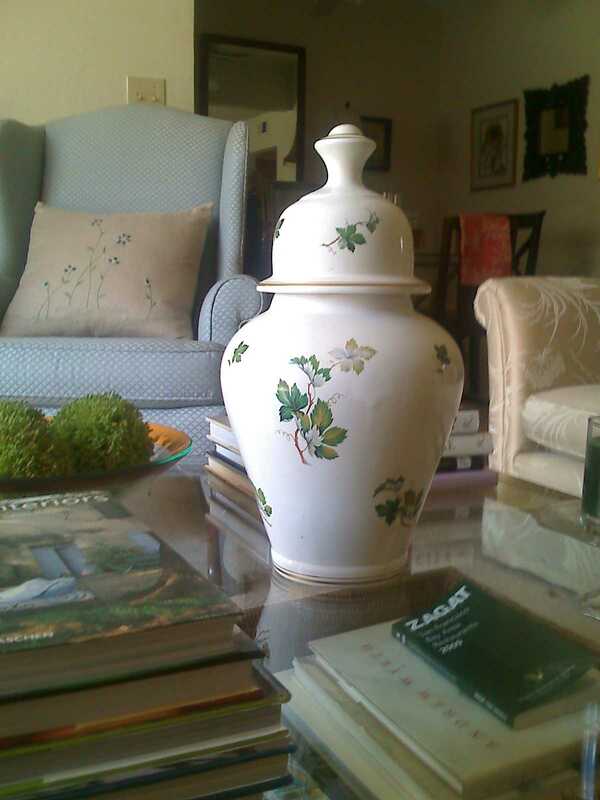 Look closely before discarding anything because re-purposing those pieces may be a good option. If you can't find a use for them, put a mover's blanket over them and store them in a dry spot of the garage. For now, identify them as utilize, save, or toss then photograph them. Step Two- Prioritize what you need. The first purchases to make are the biggest investments: your sofa and your master bedroom mattress. Get the best quality sofa your budget allows. A heavy frame and good cushions are your first two priorities. Fabric quality is number three. If you don't spend the money on a good sofa, you will regret it in less than a year. The cushions get wobbly, the frame gets shaky, and the comfort level lessens. Go to a good furniture store that is not PB. Their products are beautiful but I am not convinced their sofa prices represent the quality they sell. Do a sit test. You will sense a certain "heft" to a good sofa. The cushions should support your hips and lower back. I love Best Slipcover Company's quality. Their retail pricing is close to PB. Their cushion and frame quality is fantastic. Their fabric choices are attractive and mostly less expensive due to the fact that they are slip cover fabrics and not upholstery fabrics. They are a Los Angeles company and if you contact them, they will tell you where to find their retail merchants. Step Three-Plan a purchasing timeline. A three to five year purchase plan is perfect for the first basic purchases. In this order purchase Sofa, arm chairs, coffee table, dining room set, master bedroom set, occasional tables, accent chairs, hutches, and china cabinets. Fill in the blank spots with things like etagere's and book cases. Step Four- Make room for purchasing the occasional whimsy. At some point you will come across something you simply must have. Some home furnishings have personality or uniqueness that justifies straying off your plan. Go ahead, but only if it feels really right. Impulse buys can produce lasting style providing they are timeless and are something you truly love. Step Five- Polish your look. Create continuity with fabrics, furniture finishes, paint, flooring, and accessories. 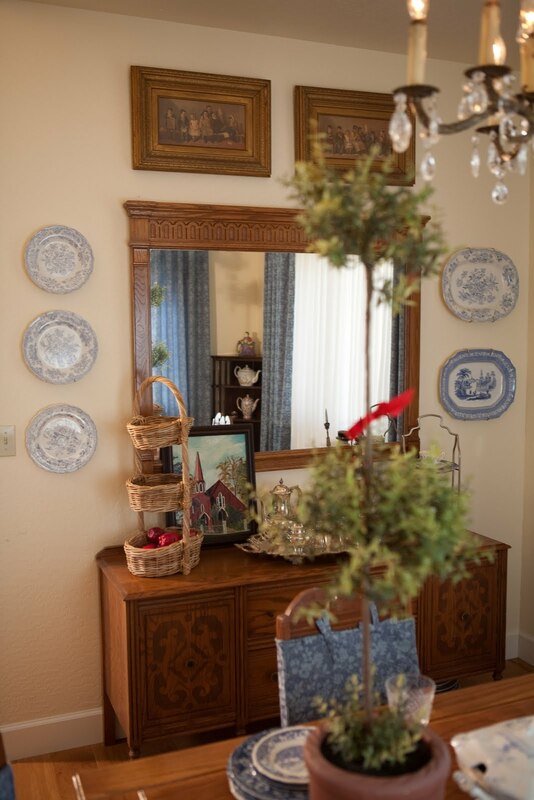 Develop your home's personality, without the use of themes. Start investing in art. Make purchases that are lasting and of the best quality you can afford. The first entry of The Joy of Nesting. When I think about the title of this journal, it takes me back to a time when I was a young wife and mother. Our first house was a small, two story A-frame surrounded by decks and beautiful mountain views. Decorating then meant modest decisions based on necessity. If I knew then what I know now, I would have been more confidant in my decisions. As someone with design experience, I feel compelled to reassure people. When it comes to furnishing a home, young couples are faced with a blank slate and zero experience. They need professional help as much if not more than their older counterparts and are probably in the least likely position to have it. The next Joy of Nesting entry, Monday April 5th, will detail my five easy steps for furnishing the young homeowner nest. Step Five- polish your look.